There is little point in me trying to sing Bert's praises about his woodturning. There are others, much better qualified than me to do that, if it needs doing at all. The little story below brings back memories of another side of Bert. Being selected for the annual art exhibition at the Chelsea Town Hall used to be the dream of most craftsmen, but for Bert it was routine. I do not remember the exact number, but I think in 18 years, there was only one year when Bert was not picked. I used to visit him on the stand every year and it became a standard arrangement that on one evening of the show we had dinner at a Kensington Thai restaurant. On one occasion there was a noisy party in the main restaurant so we were given a table upstairs where only one other table was occupied. It was a big table; about two dozen young men sitting around it enjoying their Thai dishes and Shingha beer. Bert being Bert in no time started to converse with the people on the other table. They were very friendly and soon we knew that they came from a small town in Sweden and they were the local football team, trainers, managers and other officials. It was an annual event and they had the pleasure and privilege to come over to London to play a team of similar standing, every year. One of them added: "This is an annual event too; we like this food and come here every year." Bert explained to them that it was also an annual event for us. There is a craft show not very far from here and we follow it up with our Thai dinner, every year. The exchange of information carried on. Soon we heard that in this little Swedish town their club had very diverse sporting interests. They had boxers, a very good bunch of 5,000 metre runners, a basketball team, and to our greatest surprise, six synchronised swimmers of national standard. We were duly amazed. "Football," Bert said with the usual glint in his eyes, "Football. Do you also have a ladies' football team?" "Of course," one of their officials exclaimed proudly. "We have a ladies' team and they are second best in the whole of Sweden." "That's great," Bert said. "Just one question, please. When the game and the dinner takes place next year, do you think you could you send over the ladies team? At least for the dinner, and perhaps also the synchronised swimmers." 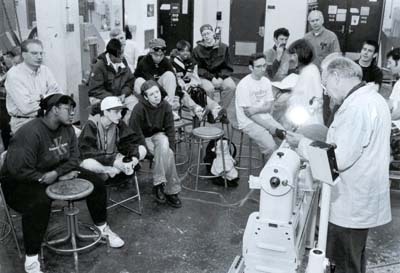 When Cleveland State University's Art Department decided to host a woodturning seminar in 1997, the first question asked was "Who is one of the best woodturners in the world that we could invite to be the featured artist?" After a bit of thought, my recommendation was Bert Marsh. Although we had never met, I greatly admired his work and made the overseas phone call invitation. Bert graciously accepted and agreed to stay in our home during his visit. The seminar was a tremendous success. Bert's reputation attracted woodturners from northeastern Ohio as well as several surrounding states. He was a superb teacher and he certainly inspired all of those in attendance. He and I took a walk on our street the morning of his second day here. I noticed him studying various trees as we passed by. Then he began casually mentioning his observations - compression, tension, grain patterns, etc. He had a depth of knowledge far beyond my beginner's comprehension. More people arrived for Bert's next series of demonstrations that day. Their friendly smiles, nodding heads and focused attention told everyone that Bert Marsh was the correct choice. That evening one of the local turners held a party of appreciation in his home. It was a fun social evening. As we left, Bert turned to the wife of our host and said "How about a cuddle?" 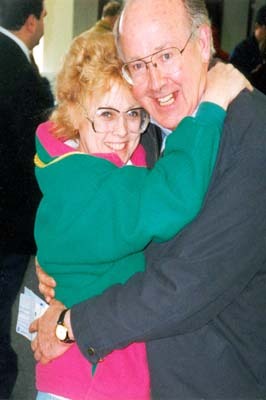 Bert's words still resonate in my heart - "How about a cuddle?" A man who possessed the skill and artistic talent to create true works of art and at the same time entertain everyone with great humour. It was many years before I actually met Bert face to face having talked at length over the phone. On meeting him I fell for his charm and humour allowing him to tell me just exactly how much he was going to pay for an item! Demonstrating at our yearly shows, Bert became a firm favourite and only missed one outing in all of the years, engaging both customers and our own staff. At our shows his humour and practical jokes became legendary as was his ability to amaze and entertain with his skill and precision. There are few people we meet with such skills and love of woodworking. We shall all sadly miss Bert, but will continue to aspire to his level of skill and endearing sense of humour. Bert was one of those rare souls who was passionate about what he did and the materials he used. 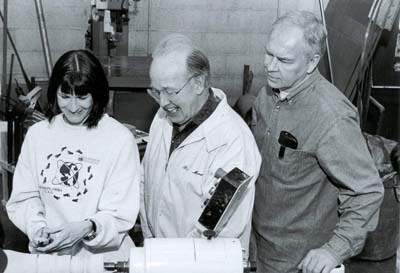 Bert was always willing to spend time with people who showed interest or shared in that passion. His work has a timeless quality; he strived to work with each piece in a way that showed its natural beauty. His work has influenced thousands of people. He had an impish humour that was so very dry it took me years to work out when he was teasing me, and even after years of knowing him there were times when I wasn't 100% sure. He was a great mentor to me and no subject was off limits when we talked over numerous meals over the years. His favourite place to eat when we went out was a Chinese restaurant in Brighton marina which was on a boat. One night after a meal the tide was low which meant the ramp - about 75 feet long which was used to get on and off the boat - was icy, it was also very windy and everything was lurching and rocking about a lot. He went first, holding on to the rails, and shrieked with laughter when he slipped a few times. He chuckled so hard when every time he went to get up - the wave motion made it nigh on impossible - he fell over again. I too tried to help, but slid down the ramp myself. Neither of us was hurt, neither ended up in the water at the bottom but the chuckling going on was as though we were five-year-olds up to no good. When a joke or something funny made him chuckle his favourite comment in between the laughing would be, "Oh shut up...!" Humour was a great part of Bert's persona but he was also a very perceptive and thoughtful man who watched what was going in many of the art and craft disciplines. He was always there to listen and offer advice and nothing was ever too much trouble. He was a true gentleman and one of a kind. I know that many will echo these sentiments. The first time I met Bert he was coming over to demonstrate for us in Utah. He was by far our most notable demonstrator. Of course, I was familiar with his work but had only seen his photo once. On the Wednesday before the symposium I invited all the demonstrators to my home for an orientation and dinner. Bert was mingling with others at my home for an hour or so and we still hadn't been introduced. I kept seeing this kindly Gent around the party and was wondering who he was. Was he crashing the party - another participant looking for a free meal? I eventually went up to him to ask his name. My draw dropped when he told me. I was very apologetic. Bert was very kind and brushed it off. I was very embarrassed since I was the one corresponding with Bert to have him come over. Anyway, all was merry and Bert and I saw each other many more times over the years and kept a good dialogue over emails. I will miss his sense of humour. It was a pleasure to know Bert - a fantastic turner and personality who was very generous to the AWGB; he supported our fundraising auctions with 100% donations. At our last International Seminar he was our honoured guest and stole the show. He had a wicked sense of humour and during the raffle, which began to go wrong due to a technical glitch; he and I were standing in the middle drawing the tickets. He whispered in my ear asking if I thought we could sneak out without anyone noticing. The ability to produce pure form without carving, painting or anything else will be missed as will the man himself. 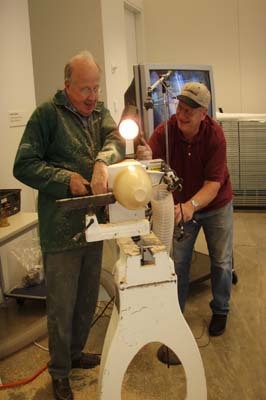 I met Bert Marsh in 2006 at the Utah Woodturning Symposium. We saw each other in the Instant Gallery and immediately knew we'd be friends. Bert had such a depth of knowledge; but he was also bright, funny, kind and generous. We laughed a lot every time we saw each other. He told me a story of introducing his work to a gallery. He walked in and the woman at the counter said, "We don't want anything." He kept talking to her and put one of his pieces on the counter. She examined it. He continued the conversation and casually put several more pieces on the counter. She finally said, "These are amazing!" and took them all. His eyes twinkled as he relayed the story. He knew his work spoke for itself. Bert's pieces are just as stunning live as they are in pictures. I started to ask him if he wanted to do a trade and got as far as, "Do you . . ." before I caught myself and thought, "Who am I to be asking Bert such a question?" His eyes lit up and he said, "Trade? Sure!" We stayed in touch through these years and I, as well as so many others, will miss him. He was one of a kind. 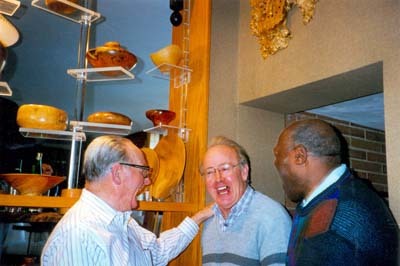 Not long after I began to take woodturning seriously, I came across photos of Bert's work. I was amazed at his ability to create beautiful forms of wood. One of his bowls was the first wood piece Anne and I purchased from a gallery. Our Quad Cities (Iowa and Illinois) chapter of the AAW was extremely fortunate to have Bert demo for us when he was here in 2006. We held the event in the large classroom of the Figge Art Museum in Davenport. The piece he turned may have been one of his largest. He left it with us and we plan to donate it to the Figge. Bert was the definition of a gentleman with a sparkle in his eyes that spoke of his love of life. Although we've lost the ability to communicate with him, Bert will be around us for as long as we live.